When it comes to making a sale, first impressions count. Your website will be one of the first things a potential buyer sees and with only 3-7 seconds on average to catch their attention, it’s hugely important that it’s up to scratch. Treat your website like another sales rep. It should be working hard generating leads for you, as long as you are supplying it with the tools and content it needs to perform effectively. Before you set about designing a shiny new website, sit down and think about exactly what you want it to achieve. What path do you want users to take when they first arrive on your site? What sort of buyer journey are you creating? What style and tone do you want to present? How are you tailoring your content to your ideal audience? By answering these key questions at the start, you’ll be able to create a comprehensive style guide that ensures all your content sits well together, rather than having conflicting styles and tones throughout. When it comes to the overall website design, keep it simple. Even in a B2B situation, you want to avoid sounding like a salesy corporate. Talk to your users on a one-to-one basis and actively engage them to engage with you, rather than talking at them. Think about the type of information your ideal customer will need. Your buyer personas will help you hugely here, in deciding how to structure your website and what content should be included. Your entire website should be designed around the needs of the customer, not the information you want to get across. Consider issues such as: How easy is it to use and navigate? Can the user find exactly what they want in a short amount of time, or is it hidden away? Also check how your site performs on a mobile device. More and more people nowadays use mobile phones for searches. If your website isn’t up to scratch it could suffer with Google’s move to Mobile-First indexing. All websites will now be judged on their mobile version, even for desktop searches. So if you want to appear in searches, you need a good mobile-friendly site. By far the most efficient way to combat this is to have an adaptive design, i.e. one which offers the same content for both desktop and mobile users, but where page layout is adapted based on the device being used to view it. This keeps all users (and importantly Google) happy. One common mistake is to put too much effort into writing for search engines, rather than thinking about the end user. Yes, you need to make your website Google friendly, but you should always write like a human, for a human – not come across as a machine. If you want to get the most out of your website, you need to consistently create valuable content that’s relevant and helpful to the target audience you’re trying to reach. Search engines themselves want to provide relevant, engaging content to their users and are constantly evolving to achieve this aim. 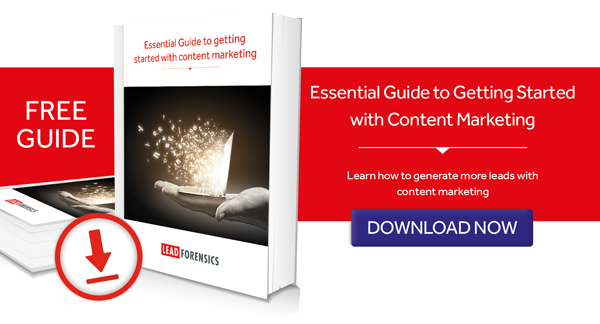 This has led to content marketing becoming an increasingly important part of any B2B website. When someone visits your website, you then need mechanisms in place to try and capture their details, so you can enter them into your sales pipeline. This can be done in a number of ways, including using contact forms that encourage people to find out more; offering gated content (such as a download) that can only be accessed once in exchange for contact details being given, or using software like Lead Forensics, which can reveal exactly which businesses have been visited the website, even if they never make contact with you. Once you have these valuable details, you can start to qualify them and move them gradually along the sales pipeline and closer to a sale. Just remember, your website needs to cater for new users, but also to nurture existing leads along and to take care of existing customers. When you’re busy trying to generate new leads, it can be easy to lose track of the bigger picture but overlooking your other audiences can be a costly mistake. Many websites combat this by keeping the main area of their website focused solely on lead generation, while creating one or multiple subdomains that are designed for customer service and retaining the existing audience. As an example, the Lead Forensics Academy is an online training platform available to all our customers. The academy is essentially a huge knowledge base, locked snugly behind the “log in” button, so it can only be accessed by existing users. By using this set up, all our existing clients can find exactly what they need with the minimum time and effort.